Since its introduction in 2007, the aquastream XT series of pumps has set the reference as a virtually noiseless water cooling pump. As successor to the proven aquastream Rev. 3.5 pump, the pump controlled has been extensively revised and updated with new functionality. 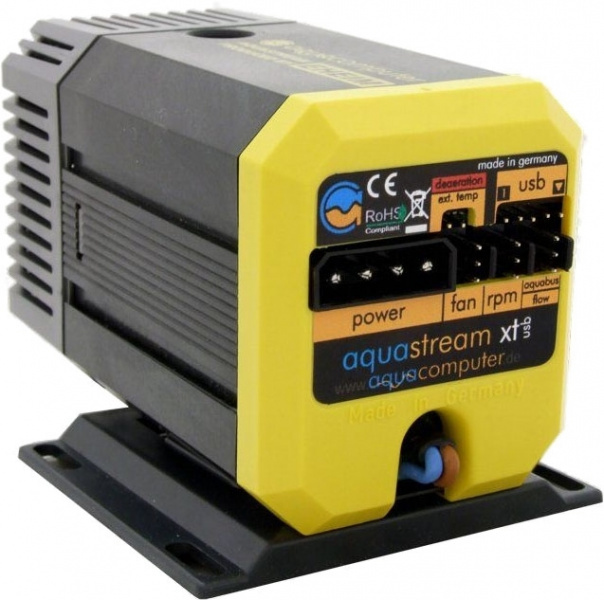 The aquastream XT pump is not only a pump, but a highly integrated and microprocessor controlled data acquisition and control unit for your water cooling system - unique and unrivaled. Compared to its predecessor, the aquastream XT boasts a massive increase in features. All aquastream XT versions are equipped with an USB interface, allowing for a comfortable configuration and constant monitoring of your pump. Our free of charge aquasuite software can be downloaded from our website and supports all current Aqua Computer products. Depending on the activated software version of the aquastream XT pump, further features include a fan output, a water temperature sensor, an external temperature sensor input and a flow sensor input. In total, the most extensive Ultra version of the aquastream XT series includes all important controlling and monitoring options for a water cooling system. The new features also include a impeller rotation detection and automatic maximum pump speed determination, ensuring safe operation at maximum speed. In contrast its predecessors, the pump controller of the aquastream XT pump is integrated into the pump body - without increasing the dimensions. Going into detail: High power and smart electronics. The pump mechanics continue to rely on the time-tested Eheim technology, renowned for unmatched quiet operation and durability. Im comparison to the predecessor, the maximum delivery height has been increased to sensational 4.2 meters - making the aquastream XT pump one of the most powerful water cooling pumps available. To achieve this, intelligent motor driving combined with complex algorithms and measuring were implemented. Impeller position, current, voltage and power consumption are monitored more than 1000 times per second to calculate optimum motor drive parameters. Depending on system configuration, the pump can operate at up to 6000 rpm. Dpending on your preferences, pump speed can either be automatically configured by the pump controller or be manually set to a fixed speed using the aquasuite software. Current pump status and further data is also available via USB or aquabus connection and can be inspected using the aquasuite software. The aquasuite software automatically detects all currently connected Aqua Computer devices and includes data logging and visualization features. 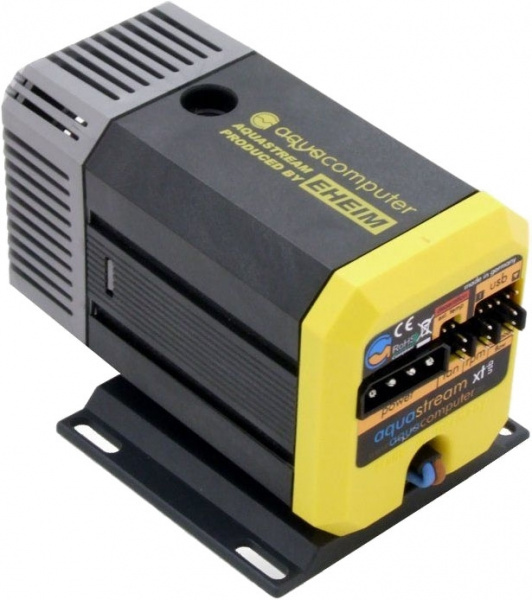 The pump controller can also be configured to generate a fan speed signal to be connected to a fan header of the motherboard, allowing for error processing through BIOS options depending on the motherboard. Sensor technology: Water temperature sensor included. No competitive product can currently offers something even close to the features of the aquastream XT pump. The Aqua Computer development team has included a water temperature sensor into the pump. This sensor data can also be accessed via aquabus if an aquaero controller is connected to the pump. Temperature sensors on the pump controller monitor the temperature of the power amplifiers and are used to protect the electronics: In case temperatures rise above predefined limits, strategies are applied to reduce heat load for affected components to prevent controller damage. 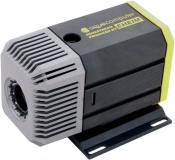 External connectors add further monitoring options: An additional temperature sensor and a flow sensor can be connected to the pump controller. Both inputs are processed with high accuracy and can be included in user configurable alarm evaluation. Integrated fan controller: Intelligent controller for silent operation of your system. Maximum heat dissipation when needed, minimum noise during normal operation - the aquastream XT fan controller offers both. Unseen by the user, the implementation of a fully fledged PID controller has only one goal: Keep your system exactly at the temperature that you wish for while keeping fan noise levels down to the minimum. The PID controller is updated more than 1000 times per second, measuring fan speed and adjusting power output. The fan output delivers a precise analog voltage - not a chopped PWM voltage resulting in additional fan noise. The fan controller comes with presets for all PID parameters, so you do not need an engineering degree to set up you water cooling system. However, if you want more options, all parameters can be modified. Fan speed can be automatically adjusted depending on internal water temperature sensor data or external sensor header - or manually be set to a fixed value. Fan speed monitoring with alarm options is available as well. Safety is one of our primary goals: The fan controller automatically detects if the load connected to the fan header is more than the output can handle. If so, a two step security feature first sets fan power to 100 % to minimize heat dissipation in the fan ampifier circuitry. If this is not sufficient, another alarm is raised and the fan output is switched off. Just to let you know: The fan output can provide sufficient power to connect three Aqua Computer airstream fans in parallel - enough to equip a 360-size radiator. Buy all features now or upgrade when needed? Development of features is both time consuming and costly, features have to be maintained regularly and not every user needs the full set of features. This is why we decided to let you choose between the aquastream XT versions Standard, Advanced and Ultra. This means you do not have to features you do not need, while allowing you to upgrade your pump at a later time. All you have to do is buy a key code for your pump and enter it in the aquasuite software. This will permanently activate the full set of features of the Advanced or Ultra version. 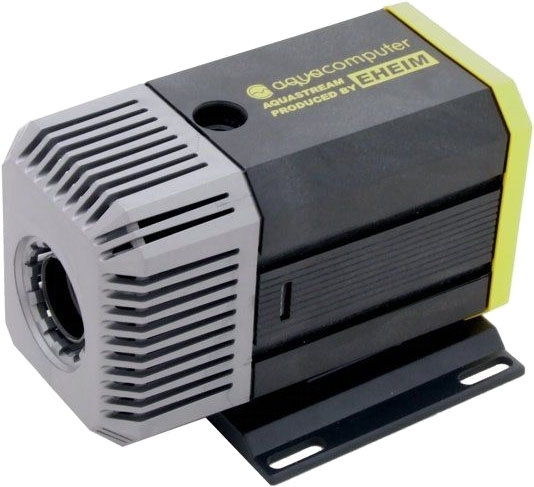 If the pump is to be installed to an aquabay unit, our adapter 93225 is required for the suction side as well as a compact 90° G1/8 hose connector compatible to your hose dimensions! Very old versions of the aquabay (produced before September 2007) are not compatible.